Miami is a hotbed when it comes to travertine. This product is very popular for use as indoor or outdoor floor tiles, and it is also reasonably priced when ordered in bulk. Local merchants are always on the lookout for the best deals on full crate loads of travertine sheets. Stonexchange, a local company serving Miami and all of South Florida, offers some of the lowest prices on fine quality travertine. A beautiful natural stone product, travertine is suitable for many uses and stands up well to the elements when properly treated and maintained. Depending on where it is placed as a floor covering and to what degree the stone experiences contact with foot traffic, travertine can either be a smart investment in a property or a total failure. Ordering the proper type of travertine is essential. Stonexchange offers merchants, flooring companies, home improvement centers, and local contractors some of the finest quality travertine on the market. We are a direct importer of everything from sealed, filled, and honed floor tiles to expertly designed mosaics and inset pieces. Our company guarantees the lowest wholesale prices available, and we deliver direct to the customer from our Miami-based distribution center. Many folks balk at the idea of using travertine as a floor covering. Perhaps this is because they have seen actual tiles and noticed the rough, uneven appearance. However, travertine comes in many different styles. The rough, rustic sheets that are unfilled and sold with no honing performed are used for other applications. Honed and filled travertine has been sealed to make it virtually weatherproof. These tiles are more expensive than unfilled, chiseled travertine because of the lengthy, complicated process involved. The resulting per-piece price is somewhat prohibitive unless the seller has obtained this product in bulk from a direct importer and distributor. Travertine is often cut into larger rectangles that are later sliced into individual tiles. This stone product is available in the standard 12-inch squares, although many contractors bring in orders for floor coverings involving larger, rectangular or odd-shaped tiles. Depending on the actual order instructions and the desires of the customer, final cutting may be necessary at the job site. Travertine tiles are set in much the same way as ceramic, marble, or granite. The tiles are placed directly on the subfloor and bonded with a combination of cement and grout. If the tiles are properly treated before placement, minimal maintenance is required. The sealant applied to the tiles makes the product weatherproof and keeps the color from fading. As stated, travertine is rather expensive to purchase because the slabs are heavy and must be shipped great distances from the quarrying site. Travertine is usually sent to a local manufacturing operation and cut into thin sheets before being packed into large freight containers. The containers are shipped worldwide, and some countries impose very high import tariffs. Ocean freight companies charge by the container. If these containers are only half-full, the importer loses money. Stonexchange has a direct connection to manufacturing operations located overseas and imports full containers of travertine on a constant basis. Customers ordering full crates or pallets of travertine save money because the overland shipping procedure is less expensive. The product is already in its container, meaning the amount of labor required to process it for shipment to the client is reduced. The crates are sent from the distribution center to the customer address using a reliable, locally operated freight service. Ordering in bulk means greater choices of placement patterns are available to the installer. Because the tile setting procedure often involves special cutting to ensure proper fit of travertine pieces, it becomes essential for the contractor to have plenty of products on hand. This allows for a greater selection of pieces to make sure the patterning is uniform. Grouping similar pieces together is very difficult when the supply is limited, and a greater amount of scrap pieces end up being thrown away. In and around Miami, travertine installers are always looking for a reliable source of product. A contractor may win a bid for an installation job requiring hundreds of large-sized travertine tiles. The job may be at a condo complex development or resort, and each unit may specify a different pattern of tiles or a unique color shade. This can present a headache for the flooring product merchant if he or she does not have a large inventory available. The installer knows that money is saved if the entire order is placed ahead of time. If the merchant has ties to a direct importer and distributor such as Stonexchange, both merchant and contractor will save money. It is also imperative that the product be made available within a matter of days. Stonexchange is located right here in Miami, and this is great news for flooring company merchants in South Florida. Because our company keeps a large inventory of tile products at our warehouse facility, commercial clients need not wait around for weeks to obtain their product. We can ship to a job site, home improvement center, or flooring company outlet in as little as one or two business days. A direct importer that has ownership or management involvement in the manufacturing process is the best bet for obtaining the finest travertine tile material. It is in the best interest of such a company to closely inspect the product for quality because the success of the operation depends on satisfying the client. Think of Stonexchange as a self-employed quality control operation. Since our success depends on delivering the best quality material, we have to personally inspect our product, because there is no middle man to do it for us. Our travertine is inventoried according to grade, color, and intended use. If we do not carry the exact style requested by the client, we will complete a custom order or locate the product elsewhere. Stonexchange stays in business because our low wholesale prices are matched by our pickiness when it comes to material quality. The building industry is very competitive, especially in the Miami area. Because of the mild climate, construction continues year-round, especially interior decorating and remodeling. This means that travertine is in demand throughout the calendar year. Many importers and distributors ramp down their purchasing operations during the winter months, but Stonexchange imports large amounts of floor tiles on a constant basis. A reliable supply of top-quality travertine at any time of year is what sets us apart from the competition. It is important to provide as much information as possible when requesting a price quote. 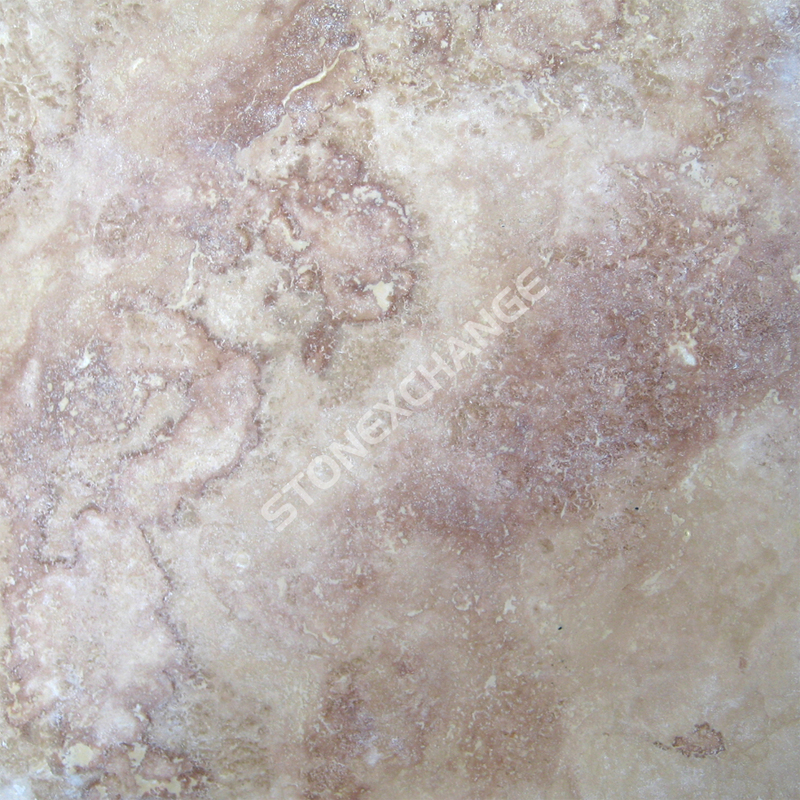 Travertine is available in various shades, sizes, and textures. When asking for a price estimate on a large, full-crate order of travertine tiles, remember that the final price depends on the type of tiles needed for the job. If custom pieces are required and are not in stock at the Stonexchange warehouse, we will inform the customer as to where they are available and when they can be delivered. Don’t get left out on the great savings on fine-quality travertine tiles. Contact us today and find out how affordable wholesale travertine can be when ordered from a direct import company. Interested in becoming a dealer? We’ll give you all the details!